I write and speak a lot about the importance of demographics to community and regional prosperity. 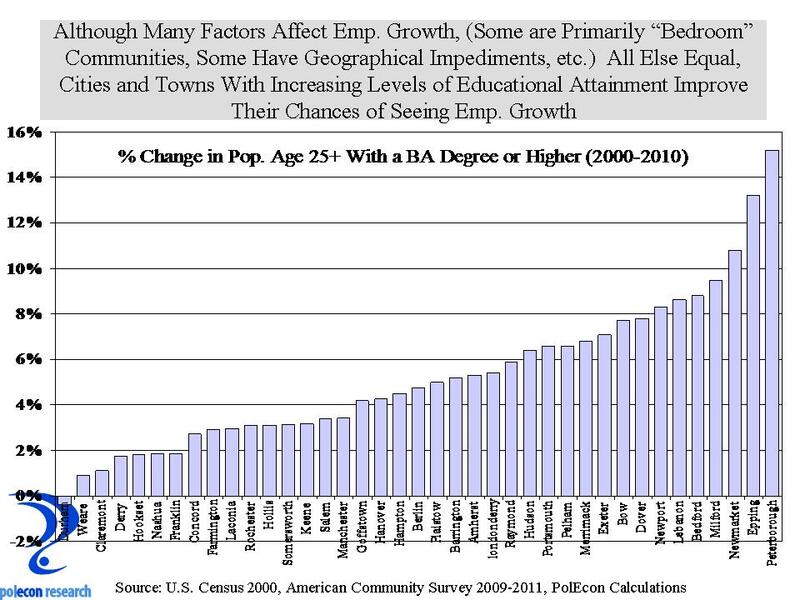 Over the past several years I have written and spoken about my belief that communities wanting to increase the number and quality of employment opportunities available in their town increasingly need to recognize the importance of being an attractive place for skilled individuals with higher levels of educational attainment. Employers in emerging and growing industries locate in areas where the pool of talent (skilled, well-educated individuals) is “deep” or growing. A community can still see employment growth even if it doesn’t have a lot of skilled, well-educated individuals if it is located in a region that does have enough of them but the impact on and benefits to the community will be very different. It is hard to empirically test the importance of skill levels and educational attainment to job growth in individual communities but anyone involved with the location and expansion decisions of employers knows how important the availability of a skilled and educated labor force is. Because the occupational needs of employers in different industries varies greatly, I, and others, often use the percentage of the population age 25+ with at least a bachelor’s degree as a surrogate for trends in the education and skill-level of the workforce in a community or region. It’s a good way to labelled an elitist, at least by those who don’t know anything about you. I don’t think only college graduates can get good jobs but it is clear to me that trends in the educational attainment of the population of cities and towns is a pretty good indicator of how the economic fortunes of a community are changing. I’ve tested the relationship statistically and found that there is a relationship between the change in the percentage of individuals age 25+ with at least a BA degree in a community and employment growth over the past decade. There are a lot of factors that influence employment growth but over past decade communities that have had larger increases in the percentage of individuals with high levels of educational attainment generally have had better job growth (or at least less negative growth). The relationship narrowly missed statistical significance when tested on NH’s 40 most populated communities. Since the recession in the early 2000’s, there has been virtually no private sector job growth in NH (primarily because the last “‘great recession” wiped-out gains from the middle of the decade). The chart below crudely divides NH’s larger communities into quartiles according to the change between 2000 and 2010 in the percentage of their population age 25+ that has at least a BA degree and the mean change in private sector employment between 2003 and 2011. One caveat, the figures for 2010 used to calculate this is based on the three-year average of American Community Survey values and smaller communities have larger margins of error in the survey results. It is just one of the challenges in documenting the relationship between demographics and economic performance at the community level. Nevertheless, I think the data point to a relationship were towns that are seeing increasing levels of educational attainment among their population are performing better economically than than those that are seeing less of an increase. It also says a lot about how the character of a community might be changing. I live in city that has seen a significant increase in the percentage of its population with a BA degree or higher over the past two decades. That change has contributed to changing expectations of the community (the type of services and amenities it offers). That type of change creates a clash between the old and new that has and continues to characterize many communities. In many ways I believe local tax cap debates are more about demographic and socioeconomic changes than they are about economics and fiscal policies. But I digress. Skilled individuals with higher levels of educational attainment have the most economic opportunities and they are the most mobile. I think keeping and attracting skilled individuals with higher levels of educational attainment is an increasingly important economic development strategy for communities. Looking at changes in educational attainment between 2000 and 2010 among NH’s largest communities shows some interesting patterns. Not surprisingly, some of the communities that have done the most to restrain expenditures have seen the smallest increases in educational attainment levels (some towns like Durham had such high levels – 77% – they have no way to increase much). Spending liberally is never a good thing but providing the services and amenities desired by skilled and educated individuals and families at a price (in terms of local taxes) lower than other communities is a good way to accumulate the talented workforce that can increase real prosperity in a community. Just adding skilled and educated individuals isn’t enough for employment growth, particularly if a community doesn’t want to be a center of employment or is otherwise inhospitable to employment growth. I don’t think a low tax price alone is enough to attract talent and I don’t think providing amenities and services without regard to price is enough either, but too often never the twain shall meet in striking a balance between prices and services and amenities and longer-term community development objectives. I don’t know many local budgets that can’t be cut but unfortunately the cuts usually come at the expense of those services and amenities most likely to help a community attract or retain individuals with the most economic opportunities and choices of where to locate. When I say or write these things I risk being labeled a big spender or liberal. In reality I am just documenting trends that seem pretty clear to me. Nevertheless, my advice to others is never bring data to an ideological fight if you want to escape unscathed. In an age of austerity, spending decisions need to consider both the current fiscal reality as well as the longer-term implications for the economic prospects of a community. This entry was posted on March 4, 2013 at 2:48 pm and is filed under Demographics, economic development, Educational Attainment, Fiscal Policy, job growth, NH. You can subscribe via RSS 2.0 feed to this post's comments.